A customized training program for teams, leaders & organizations to achieve a Next Generation Business Culture. SmartCulture is a unique training curriculum designed to shift an organization into becoming a DAO (decentralized autonomous organization). Where individuals feel a deeper sense of ownership to their role and the company is guided by a Vision, Mission & set of Core Values. The program consists of Cause Level Training, in-depth personal development & culture strategies. We work closely with leadership teams in order to transform the organization's culture and improve business performance, profitability & sustainability. Download our SmartCulture Brochure to further explore the Next Generation Business Culture program for your organization. Want to learn more about our SmartCulture? Team Alignment to Create Brand Vision, Mission & Values. Form Trust within teams & install High-Performance systems. Strategies & trainings to build lasting, self-evolving results. We begin with a Culture Values Assessment (CVA) where we evaluate the overall health of an organization. Following the CVA we interview leadership teams to build a relationship for the following training. Workshops with Leaders are designed to create a shared understanding of the training process and objectives. This process creates team alignment through establishing the organization's Vision, Mission & set of Core Values. The second phase is to apply trainings to create synchronicity and build trust between team members. We focus on strengthening a company's culture, brand identity & improve external stakeholder relationships. Leadership will develop a broadened perspective of the organization, improve their decision-making, communication & performance. The process of improving and evolving the brand's new culture by reasserting it through application & feedback. The training will allow the organization to thrive by strengthening the team's muscles of high-performance language, behaviour & decision-making. Teams will receive a curriculum summary and follow-up sessions to track progress and make adjustments. How to attract, motivate and retain talented people? How to increase profitability, sustainability and be present to the needs of all stakeholders? How to increase innovation, creativity, productivity, quality and customer satisfaction? How to increase accountability, openness and trust? How to run more engaging and productive meetings? How to handle the inevitable disagreements and conflicts? How to improve cooperation between virtual teams spread across different locations and countries? Mark has been traveling the world for over 20 years and has worked in more than 10 different industries, leading him to develop a unique approach to life: “I have come to understand there is only one constant in life: change”. Coming to fully realize his place in this world through travel and personal development, Copeland compiled his experiences and knowledge into tangible best-practices that can be implemented into people and organizations willing to transform their status quo. Values Centre was founded by Richard Barrett. Who has developed a unique business model that can be used on a personal, team, organizational & societal level known as the 7 levels of consciousness. BVC provide their consultants with a variety of tools used to accurately measure the health of organizations through values & other assessments. Contact us and schedule a call to establish a brief introduction. Conduct a CVA across your entire organization. Design customized curriculum and begin the training. *One must complete step 01 (consultation) before commencing deeper into the program. 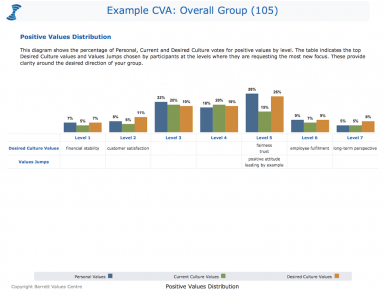 The CVA creates reports & diagrams to give you insight on all levels of your business and employee performance. 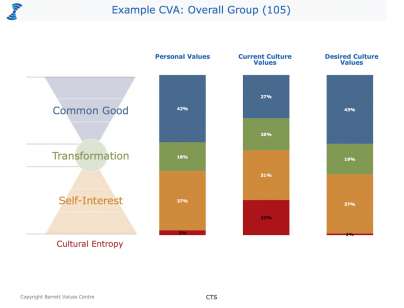 What do you think your company's current values are? What would you like your company's values to be? These are then mapped out on the 7 levels of consciousness model to measure the levels of dysfunction (cultural entropy), shown through limiting values. 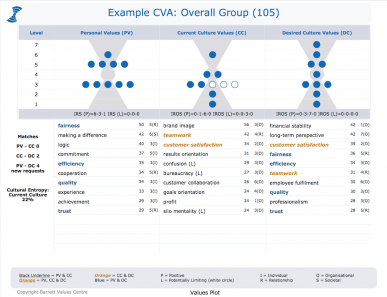 Download BVC's sample report to get a deeper understanding of the Culture Values Assessment. Enhance team & business performance. Increase productivity, efficiency & output. Improve the financial health of the organization whilst bringing about societal & environmental impact. To develop a healthy & balanced lifestyle. Create more free time, improve relationships & well-being. "I first attended the training with the hope of finding a solution to help me keep calm at work and to get my staff to do what I wanted them to do. Through the training, I came to realize that the changes I wanted would first need to come from me. He explained that the energy that I brought to work and put into my communications was driving my business in a direction that I didn’t want. The biggest takeaway and most effective method for me was the sharing of values. Since attending Mark’s training in November we have not lost a single member of our team (turnover previously was fast & furious), our staff morale is at its highest, our sales have grown and grown & our guests are having the best experiences with us. Mark said that through his work I would see dramatic changes and it’s absolutely true. From my own experience, I can hand on my heart say that his coaching & consultancy will question the way you currently operate your business and conduct your personal life, giving you the tools and the courage to improve." Coached people with all levels of knowledge. A customized corporate training program for teams, leaders & organizations to achieve a Next Generation Business Culture.